A day after announcing a major local investment summit, President Cyril Ramaphosa said he and his team would start inviting “leading investors and leaders of business” during his visit to the UK. Ramaphosa is leading South Africa’s delegation to the Commonwealth Heads of Government Meeting taking place on Thursday and Friday. Before leaving for London on Monday evening, the president announced plans to host a major investment conference by the end of September in a bid to attract some R1.2 trillion in investment over five years. Ramaphosa said in a statement on Tuesday morning, after arriving in the UK, that team SA would use the summit as an opportunity for the marketing and promotion of South Africa as an investment destination. 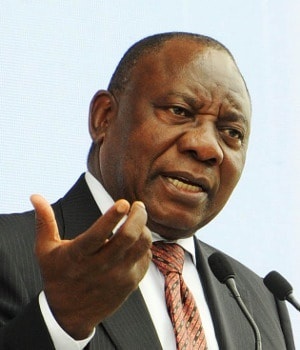 On Monday evening Ramaphosa announced the names of four 'special investment envoys' who will over the next few months sell South Africa as an investment destination to foreign and local investors. They are executive chair of the Afropulse Group Phumzile Langeni, former finance minister Trevor Manuel, former deputy finance minister Mcebisi Jonas and chair of the Liberty Group and former Standard Bank chief Jacko Maree. Economist Trudi Makhaya, meanwhile, has been appointed Ramaphosa's new economic adviser. According to the statement, the SA president will also pay a courtesy visit to the Queen, and use the summit to lobby the 53-member Commonwealth for South Africa’s candidature to the UN Security Council for the term between 2019 and 2020.